Gently poached to preserve vital nutrients and vitamins, this unique recipe includes 84% organic grass-fed lamb, using a ﬁne balance of only muscle meat and vital inner organs. 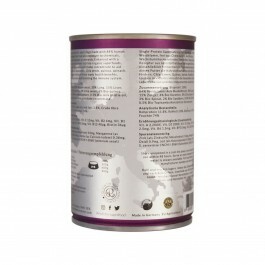 Essential additional nutrients are provided through a carefully formulated mix of bio-organic superfoods, including seabuckthorn, carrots, chia seeds, quinoa, spinach and milk thistle oil, creating a balanced and delicious superfood with multiple health beneﬁts. This recipe has been enhanced with fermented Jerusalem artichoke concentrate, which has a highly beneﬁcial pre-biotic effect to aid digestion and your dog’s ability to absorb the nutrients in this recipe. The combination of chia seeds, quinoa, seabuckthorn & milk thistle oil has many health beneﬁts, especially for supporting liver function and supporting the immune system. Sunday Roast represents A Taste of London, and is inspired by The Rockster’s Journey. 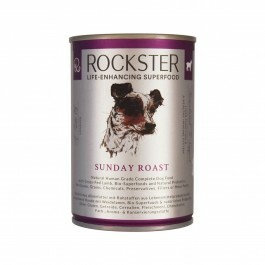 What is in Rockster Sunday Roast?